This peak is #27 on the Height List for Utah . 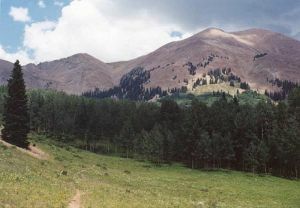 This peak is #2 in Prominence List for Utah .Mount Peale is the highest point in the La Sal Mountains east of Moab, Utah. Trails from various directions lead to the base of the mountain, which is a walk up. Name Notes: Named after Albert Peale who was a mineralogist on the Hayden Survey of 1875.